Truly outstanding with rave reviews from professionals demanding the best in power and quality. 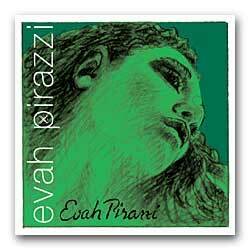 These Pirastro Evah Pirazzi Violin Strings feature a Synthetic core string with warm tonal characteristics. Offers wide dynamic range, and intense and brilliant colorations, and quick response. This violin strings set has a Steel E loop. Silver wound on synthetic core G string.